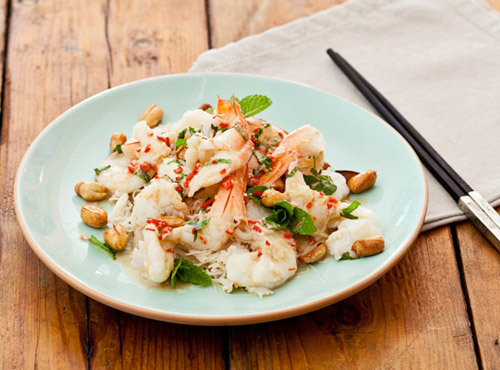 Featuring peanuts and fresh mint, this warm prawn salad becomes more substantial if combined with softened wide rice noodles or vermicelli. In a frying pan, toss peanuts in oil until golden. Tip onto a plate lined with kitchen paper and set aside. Mix fish sauce, lime juice, coconut milk, sugar, garlic, ginger, chilli and pepper in a bowl to make a dressing. Cook prawns in simmering, salted water for 1–2 minutes until pink. Toss prawns in dressing, then add peanuts and mint leaves. Serve warm.